An assortment of DPST, SPST, heavy duty, extra long handle, and double insulated toggle switches from The Hillman Group. 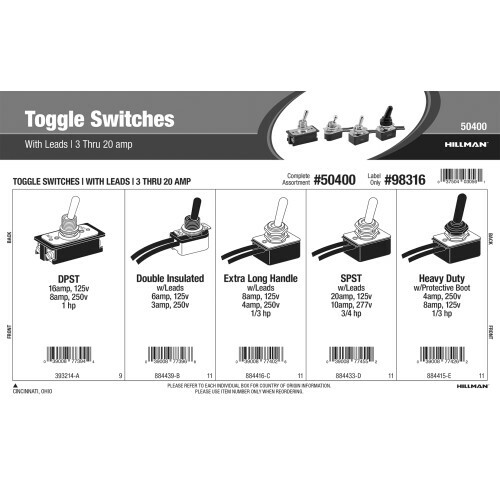 The variants in this assortment are great for use as replacement switches in industrial settings that require quick, easy hand adjustments. Variants included in this assortment come in 3amp, 4amp, 6amp, 8amp, 10amp, 16amp, and 20amp capacities. Full assortment contains five (5) items comprised of Hillman item numbers #393214, #884415, #884416, #884433, and #884439.